One of my favorite activities that we have done at LAUC-R was our celebration of National Library Worker's Day in 2016. NLWD occurs during National Library Week, and is promoted by ALA's Allied Professional Association. I was LAUC-R Chair at the time, and I wanted to celebrate the day and recognize the hard work of all our staff. I have always felt that hand-written notes of appreciation and thanks have a great impact, and so decided that we would send postcards with our notes of thanks to ALL library staff, including our wonderful student assistants. I designed four different postcards, which were hand-embellished with stickers and washi tape. 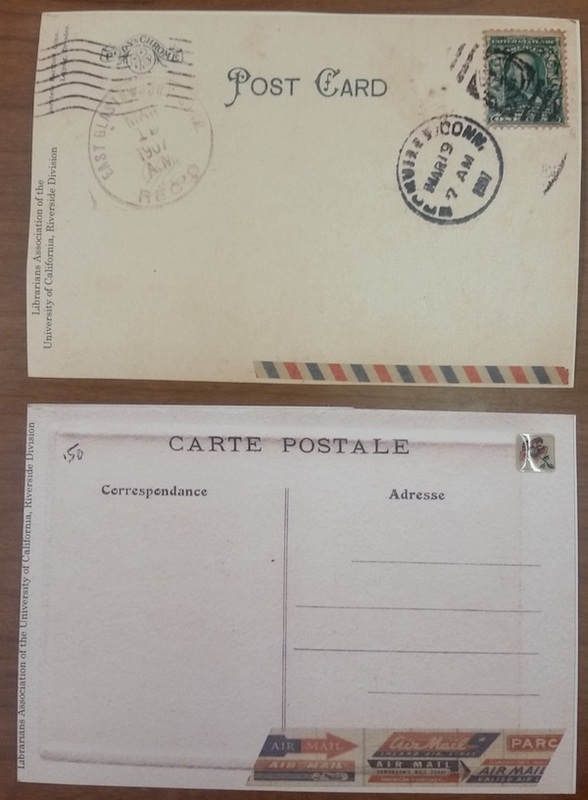 The postcards were then hand-addressed and a note was written on them, thanking the recipient for their hard work. This was all done by a dedicated group of librarians who got together to fill out the postcards. Although our hands were tired and sore from all the writing, we managed to send out about 200 postcards. Library staff were thrilled and they brought a smile to many faces; some staffers displayed them prominently on their desks or posted a picture to Facebook. 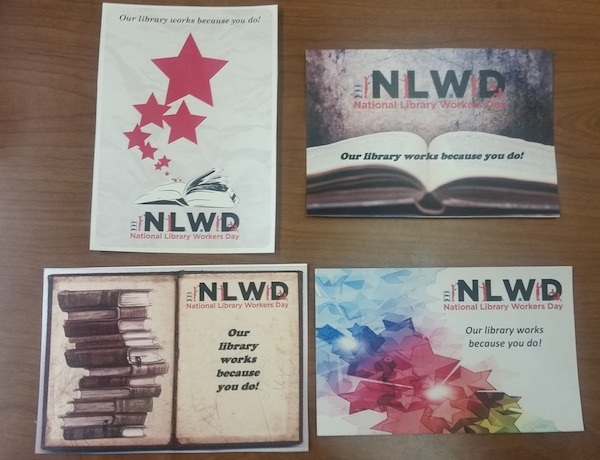 NWLD Postcards (front). Click here to view PDF version (PDF). NWLD Postcards (back). Click here to view PDF version (PDF). My memories of LAUC are a mixture of personal involvement (resulting in rewards and satisfaction) at both the local and systemwide levels, and the certainty that LAUC is important for UC librarians. From my very first year at UCR I was involved in LAUC at the local and sysemwide level. I was hired in a temporary position for a special project – UCR Library had received a contract with University Microfims in Ann Arbor, Michigan, to digitalize their entire microfilm Wing Collection. It was projected to last three years. -- Interestingly LAUC established an Ad Hoc Committee on the status of temporary librarians. The UCR LAUC Chair appointed me as a member of the systemwide committee and so began my memories of LAUC at all levels. My three-year temporary position evolved into twenty-eight years as a permanent appointment, and I saw participating in LAUC as a critical part of my job as a librarian and made feel a vital part of the University of California. Being an active member of LAUC gave me entrée to interaction with other parts of academic life outside the library. At UCR I was a member of countless committees and chaired several. This gave me an opportunity to know better my colleagues in other departments in all the campus libraries. As chair of committees, it gave me more opportunity to meet with the University Librarian and other members in the administrative offices. It gave me a voice with decision makers who influenced the lives of all of us in the library. As Chair of the LAUC-R Revised Research Guidelines, I worked closely with Vice Chancellor Michael Reagan who was very helpful and supportive. I was also a non-voting member of some Academic Senate Committees – not possible without LAUC establishing the practice. I frequently served on the LAUC Peer Review Committee (CACLS) a task both an honor and humbling. It was because of LAUC that we librarians had a voice in our advancement – one LAUC’s greatest accomplishments. Participation at the systemwide level gave me the terrific opportunity to get to know many of my colleagues on the various UC campuses. I sat on many committees and chaired several. One memorable experience was being the Chair of the LAUC Ad Hoc Committee on Peer Review – APM Revisions. I remember traveling to each of the campuses to explain the reasoning of the committee and asking librarians for their suggestions. This was an effort to make all librarians feel an involvement in a document that affected all of our professional lives. This committee, in particular, gave me the opportunity to interact with three people important to UC librarians in the Office of the President . APM Revisions had to be approved by the UC attorney in cha rge of reviewing all UC official documents. At the time, it was Myron Okada. He was not only exceptionally knowledgeable, but personable. He helped me word everything for legal approval. It was also necessary to work with The Vice President for Academic Affairs, at that time, Ellen Switkes. She also was wonderfully helpful and encouraging as was The Director for Library Affairs, Dennis Smith. When I was elected as LAUC President, it was very helpful to already know these three people of influence to assist me in championing LAUC causes. As LAUC President, I had the wonderful opportunity to get to know all the University Librarians since the LAUC President sat on all Library Council meetings where the ULs discussed important issues involving all UC libraries among one another and with members of the Office of the President. I don’t know how active most UC Librarians are in LAUC currently, but hopefully they are not ta king LAUC for granted. Without LAUC, UC librarians would have far less influence and could lose much control over their professional lives. I certainly recognized that LAUC gave me the opportunity to get out of my “cubby-hole,” meet more people on all the campuses – and, yes, often have fun – and definitely experienced terrific satisfaction in knowing I had a voice in shaping my professional life, and was an active professional involved with my colleagues on all campuses.